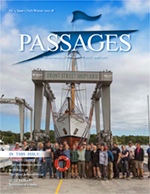 Download Volume 3, Issue 1 of Passages magazine. In this issue: The CORWITH CRAMER’s major maintenance period is in the spotlight. We’re debuting a new performance sailing cat design from McCollough Yachts. Get updates on our ongoing refits. You can also read back issues or subscribe to Passages free.